Grilled Steak Tacos are full of flavor and loaded with all the classic taco-truck toppings. 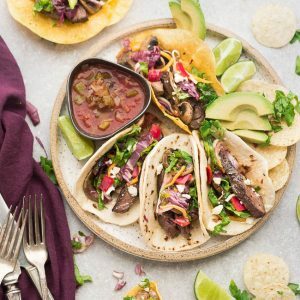 Best of all, the steak is perfectly tender, juicy and perfect for Cinco de Mayo or any Taco Tuesday. Place the steak in a large zip-top bag. Add lime juice, zest, salt, pepper, chili powder, cumin, paprika, and garlic. Seal the bag and press the marinade with your fingers to help the marinade adhere to the steak. Allow to sit for no longer than 30 minutes. Preheat grill to high heat. Lightly coat a paper towel with the olive oil and using long tongs, carefully rub the oiled towel over the grill rack. Place steak directly on the grill and cook for 5 minutes on each side. Remove from grill and allow the steak rest on a cutting board, covered with foil, for 8 minutes. Heat a cast iron skillet or grill pan over medium-high heat. When hot, add butter and IMMEDIATELY add the steak to the pan (to avoid burning). Sear for 3 minutes without moving the steak (to form a crust). Turn and cook for 3 to 4 minutes for medium rare to medium (or cook longer for the desired doneness). Remove from pan and allow the steak rest on a cutting board, covered with foil, for 8 minutes. While the steak is resting, warm the flour or corn tortillas. Cut the steak into strips, against the grain. Divide the steak strips in the tortillas and top with shredded cabbage, red peppers, avocado, cilantro, colby jack and queso. Serve warm with lime wedges and any additional toppings.